After launching On-net pack and 2 STD Packs, it’s now time to enjoy the benefits of Rs.197. Yes it’s true, now uninor customers across Kolkata and Rest of Bengal can enjoy 2000 free minutes between uninor to uninor in local across Kolkata & RoB plus 700 FREE minutes for other network calls in local which means a whopping 2700 minutes in all. Post 30 days enjoying this tariff, customers will be able to enjoy the base tariff of 24×7 badalta discount. 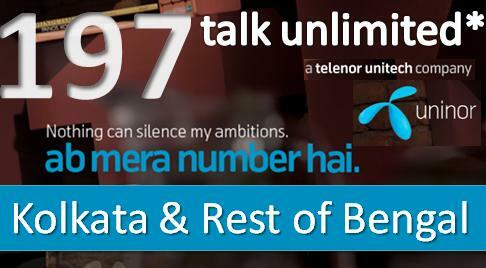 This offer can only be availed through Mobile Top-Up of Rs.197. This pack can be clubbed with 24×7 badalta discount and any sms pack. For More information, call 121 (toll free) from your uninor number or call 9062090620, if you are from kolkata or 9126091260, if you are from Rest of Bengal. Alternatively you can also log on to www.uninor.in for more offers. It is scheduled to be launched before 15th August going by the response of RC-197..
why not RC 198 lanched in kolkata & rest of west bengal ?